Looking for a tough, easy-care rose with loads of brilliant blooms? Our new Top Gun rose knocks out the competition. This tough-as-nails landscape rose offers richly colored, glistening flowers, full, dark green foliage and greatly enhanced disease resistance. Top Gun produces clusters of semi-double, medium-sized flowers and is quick to repeat bloom cycles--so you'll enjoy constant color in your garden, even into late fall. In our test gardens, Top Gun exhibited excellent natural resistance to powdery mildew, downy mildew, rust, black spot and even rose rosette disease, so common in other "tough" roses. 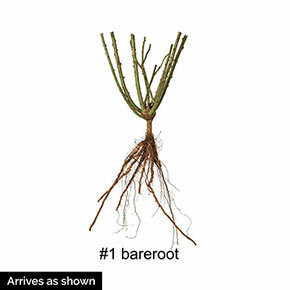 This new introduction is a top choice for beginning gardeners or gardeners who want a healthy, low-maintenance shrub rose that can be grown without chemicals. 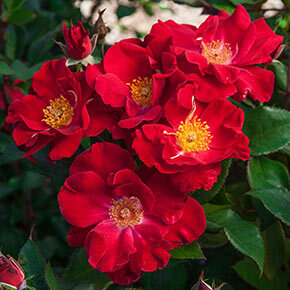 It's the best performing shrub rose you can grow, guaranteed, or we'll give your money back. 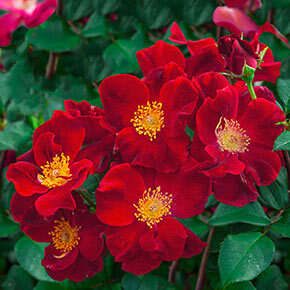 Rosa 'WEKmoridahor' PPAF Own-Root Roses are recommended for northern gardens. Grafted Roses can be grown anywhere. Flower Form: Semi-double flowers in clusters of 3-5 blooms, 3" in diam. Watering Requirement: Roses prefer a thorough watering but do not like 'wet feet'. Water early in the day to ensure foliage has ample time to dry out during the day and remain healthy.